Pool chemicals are extremely powerful. The chemicals that you use in your pool such as bromine or chlorine are corrosives and oxidisers – they can cause chemical burns or become highly combustible. When used in the proper way and carefully stored they are completely safe but that doesn’t mean that they shouldn’t be treated with great respect. If you think of just how much water is in your pool and that these chemicals must keep that water clean and sparkling and in balance then you have some idea of how concentrated and powerful they might be. The single most important thing about handling pool chemicals is this: read and follow the instructions carefully. If there is anything you don’t understand, ask your pool chemical supplier for guidance. All the chemicals that you use to treat your pool should be kept under lock and key and in a place where children, pets or indeed anybody else could get to them. Keep the chemicals in their original, air-tight containers, that way they will be clearly labelled and you can be sure that they are in a container that is suitable to the purpose. The storage area that you decide upon should be cool and dry and not expose the chemicals to direct sunlight. The storage area should also have adequate ventilation so that if one of the containers proved not to be air tight, fumes could not build up. As chemicals can react with each other, they should be stored on separate shelves or at least sensibly spaced apart and not in one great pile. These precautions will keep you and your family safe as well as prolonging the life of your pool chemicals and making sure that they work as efficiently as they should when put to the job of treating your pool. 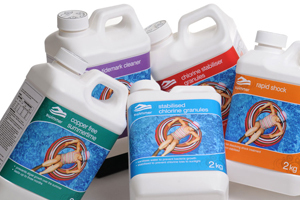 The safe handling of pool chemicals. Once the pool chemicals are in your pool and in the right dilution they are perfectly safe to swim in and even swallow but that certainly doesn’t mean that they are safe when they are in their more concentrated form. For instance, the liquid chlorine that you might use in your pool is three times stronger than household bleach before the water in your pool dilutes it. Corrosive chemicals will attack your skin and eyes just as readily as they will corrode metal. Keep all the chemicals that you use separate from each other and that includes not using the same measuring jug or container for more than one chemical. If you mix the wrong things together by accident they could burst into flames, generate chlorine gas or even explode. Whenever you are handling pool chemicals always wear eye protection and gloves and a facemask to avoid fume inhalation. Adding chemicals to your pool. When you are adding chemicals to your swimming pool, do so individually. Add them to the water one at a time. On no occasion should chemicals be added to your swimming pool when it is in use or when it is likely to be used in the very near future. You need to give the chemicals time to dissipate throughout the entire volume of pool water. For that reason, its best to add chemicals to your swimming pool in the evening after it has finished being used for the day. If the pump is running, then it will quickly distribute the chemicals evenly around the pool. When adding chemicals to your pool, wear gloves and protective eyewear to avoid chemical splash. There are automated chemical dosing and metering systems such as the Etatron ePool systems and once they are installed and calibrated, make the whole process of adding chemicals to your pool much simpler and easier. We hope that this article has been of use to you and has shown you that you do need to take care with pool chemicals but that a few simple guidelines can make your pool a safer place for everyone.